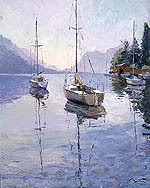 Bittar believes that "true" Impressionism is sensational and the most impressive style of art. The viewer receives a feeling of accomplishment and satisfaction that he cannot explain. The reason is simple. 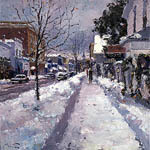 A true Impressionist artist does not paint the subject but shapes of light that touch his eyes as he works out of doors. 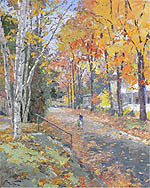 Therefore, the viewer is not able to decipher the subject matter at close view but when he steps back and beholds the piece in its entirety, not only he can see the subject matter, but he feels the movement of the wind, the atmosphere which surrounds the subject and the smells the artist has sensed as if he, himself is outdoors. In other words, the feeling of accomplishment and satisfaction felt by the viewer as he has unconsciously reconstituted in his mind the feeling expressed by the artist with strokes of colors on his canvas. This amazing but unintentional mental connection between the artist and the viewer is the secret of Impressionism's success. When Claude Monet said that it requires twenty years of experience to be an Impressionistic painter, he was not exaggerating. He believed one could only experience and master the technique by painting out of doors. It is the artist that paints in 'plein air' that encounters unexpected occurrences that a studio artist can never be aware of. For example, the ever changing light and with it the continuous movement that the shadows cast. The problems of glare upon the artists canvas and the inconvenience of bad weather. There are the extreme temperatures, whether it be hot or cold...there is snow to contend with in one case and mosquitoes in another. His subject matter is constantly moving along with all the commotion of the outside environment. These are the dilemmas that an Impressionist painter encounters and they cannot be read about in books or learned in school. The artist must rely on his own common sense, good will, discipline, determination, patience and hard work. It is only then, after many experiences and perseverance that he can discover whether his talents merit the amazing qualities of Impressionism. This long road of challenges may discourage many young, talented artists of today. Especially, when there exist surer artistic routes in this new, technological world. Young artists are able to express themselves through graphic art via the computer and can be assured a comfortable living. This technological age is luring artistic talents in a whole new direction. This is only another diversion, pulling artists away from more classical forms of painting. One of the forms, of course, being Impressionism and the 'true' Impressionist painters will eventually disappear within the next two decades. In turn, the paintings achieved during this final period of Impressionism will become increasingly more difficult to find and with this, the paintings will become priceless. The artists of this period will no longer be with us but they will have left behind their indelible mark with paintings so masterfully created in their unique mode of expression... Impressionism. When Pierre Bittar is asked about painting his Impressionistic art he responds, "If God gave me this gift, it is not only for me but also for others. I believe that the artist's duty or mission is to communicate his feelings. There is a lot of spirituality in Impressionism. This is due to the fact that painting outdoors brings the artist closer to the Creator. The result is a great sense of peace, serenity and internal happiness. In order to communicate these feelings on my canvas, I need a subject as a means. So, the subject itself is not the ultimate goal. It is nothing but a vehicle to arrive at my goal. When I discover the appropriate subject, which might be insignificant to others, I allow myself the time to absorb and enjoy what I am seeing until the point when my emotions take over and my blood begins to boil like a volcano ready to explode. It is only then when I begin to paint with phenomenal speed, expressing my feelings through strokes of color with the shapes of the spectrum of light I see."